Crazy for craft beer? You can’t seem to go far these days without stumbling across artisanal ales. Nothing like bellying up to the local bar for some local brew, but some days you just feel like cracking a cold one on the cheap in the comfort of your own home. For the love of good beer with a dash of dive bar atmosphere, we’ve created a set of Handmade Upcycled Photo Coasters to bring old school beer-sonality to your home bar. Stay in and enjoy a healthy session of homestead elbow bending, without endangering that heirloom coffee table. Some juice joints modernize by switching out neon signage for plastic, covering old worn bar wood with laminate or selling out to a hipster who fumigates, reupholsters and reopens with higher prices and younger clientele. Downtown Los Angeles has a few of the latter with King Eddy’s Saloon the most recent to get the make over. But if you’re lucky, you end up as just a wink in a camera bug’s eye and nary a mention on the internet like the Dog House, a rundown bar across the street from MacArthur Park that disappeared without comment sometime in the 1980s. Besides this shot taken from the window of a passing car, the Dog House’s only other appearance is in the background of a scene in some obscure low budget flick that dropped out a sight a few years ago. The Dog House would belong in the Bar Hall of Fame, if there were such an institution. There is a Drinkers Hall of Fame for those who care for such places. You can chance upon it if you drive east out of LA on the old Route 66 though the bar signage got the modernization treatment mentioned above. Inside it’s as nondescript as a striped down ranch house in the Valley but the painted sign that once attracted drinkers on the side of the bar is still something to admire in old photos like the one snapped on an escape from the city several decades ago. Even before digital shutters made spending $$ on film obsolete, fools like myself took as many shots as our fingers could tap out in the hope and prayer that out of several rolls of 36 at least one brilliant shot would surface. That’s one of several reasons why I don’t remember taking many of these photos, that is the where, when, why, who and whatever. Like DL’s Beef & Beer. What was this simple storefront? A precursor to Wurstkuche where instead of Belgium brew and artisan sausage they served Bud and ground beef? The Zimba Room. Now here’s a sign I pass nearly everyday on Beverly Blvd in Echo Park but you’d never recognize it. The white letters were painted over long ago so now it’s just a huge chunk of blue metal hanging on the side of a true flop house called the Lafayette Hotel. The Lafayette is a dump that no hipster would ever consider giving the gentrification make over. Any fumigation would involve torching it to the ground. But imagine if you can the bar that was once accessible from the front, a place called the Zimba Room. Zimba…the imagination is rich with visuals… Like Zimba, the name Taxi Bar inspires the mind to wander and dream of stories best found in detective novels. Taxi Bar is still visible on Third, a block or two before the street dips down into downtown. 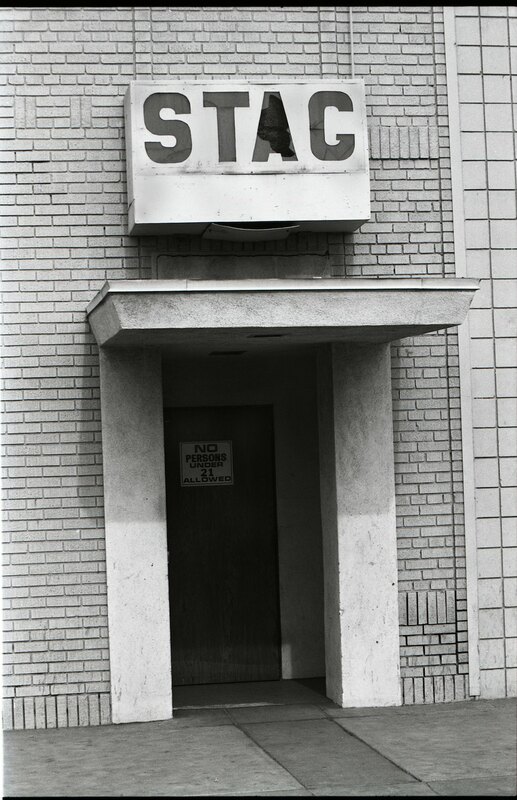 Unfortunately the sign, with blue & white letters, a star and arrow, was switched out several years ago by all new vinyl. Probably the only good part of the joint and now that’s gone too. Step back in time with some photo postcards of bygone Los Angeles Bars.